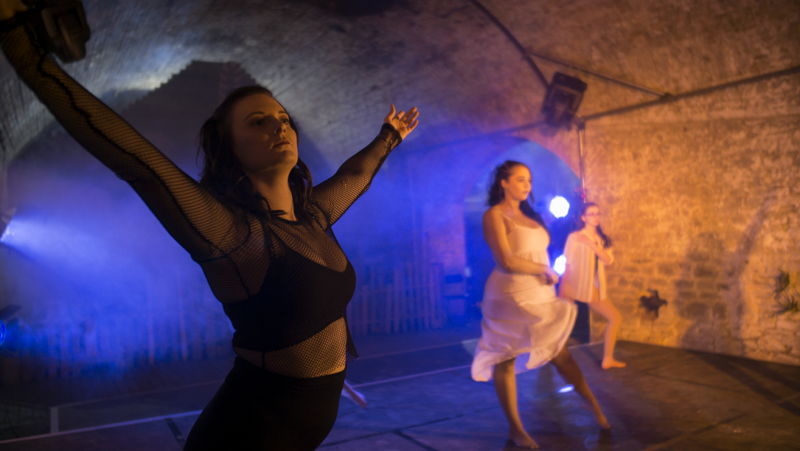 Students from the Professional and Commercial Dance degree at University Centre Weston have performed to audiences at the Loco Klub in Bristol over two consecutive nights. The modern and interactive show, called cAged (? ), told the story of the life of a dancer over each stage of her career; following the trials and tribulations she experiences on her way to the top of her profession. The performance was devised by UCW Professional and Commercial Dance Coordinator Corrin Martin, with choreography by Joe Miller and Nestor Garcia Gonzales, and was an immersive piece with the audience following each act to a different space in the underground arts venue. It explored commercial dance styles including street, hip hop, jazz and dancehall, and also featured a singer to represent the conscience of the protagonist. Corrin said: “Collaboration and performing in professional venues are at the heart of the dance courses at UCW. “The students have worked tirelessly for months on technical dance practice and rehearsals, and also on the actual planning and promotion of the show. The Foundation Degree in Professional and Commercial Dance at UCW is delivered in partnership with Bath Spa University.